We are excited to share one of our favorite projects, this beautiful garage conversion in Santa Monica, CA. 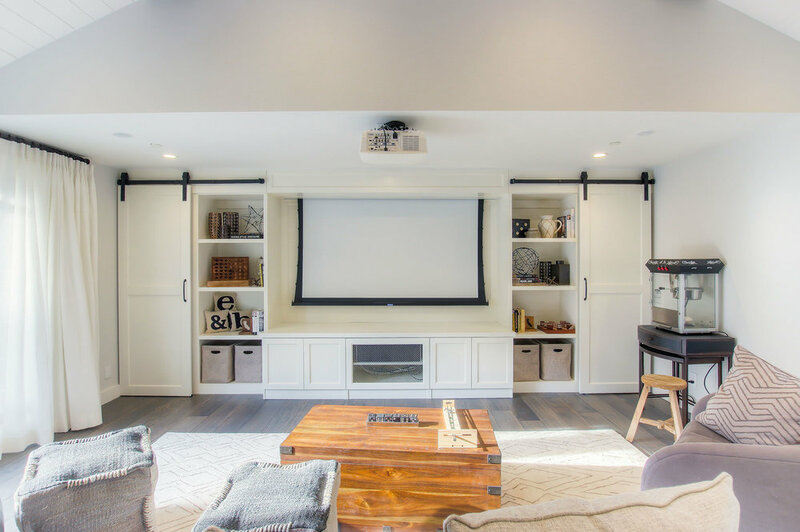 Originally a four-car garage, this space was complete transformed into a screening lounge-guesthouse with a full screening room, bar-kitchenette, bathroom and Murphy bed for overnight guests. From built in media cabinets with a retractable projection screen, to a fully functional bar area, this garage conversion has it all: new hardwood floors and sliding doors to the backyard, recessed lights throughout the vaulted wood siding ceilings with reclaimed wood beams, and beautifully designed full bathroom. 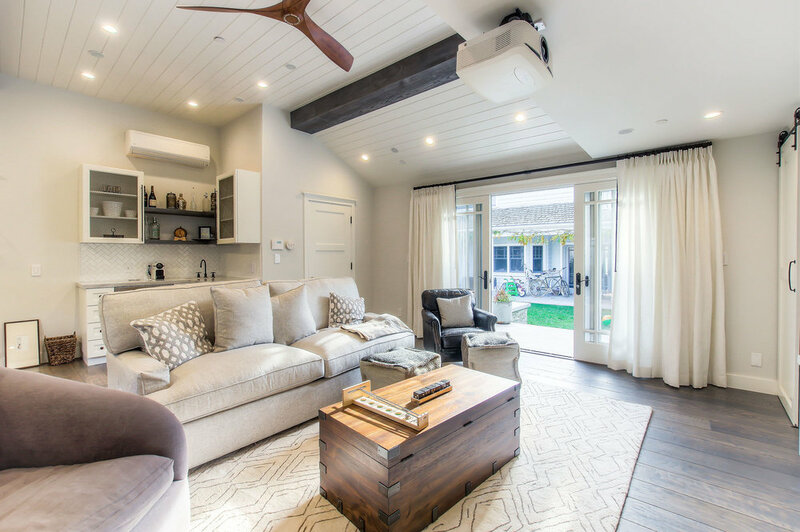 The modern farmhouse style chosen by the client creates a cozy and welcoming space, perfect for movie nights and guest entertaining. Click below to check out to this project featured on Houzz! 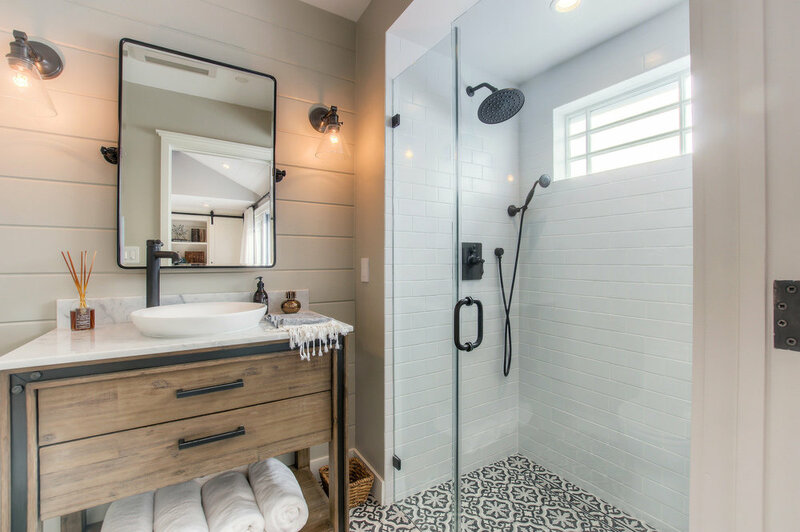 This beautiful bathroom has cement tiles on the floors with an infinity drain a custom frameless shower door and custom lighting. 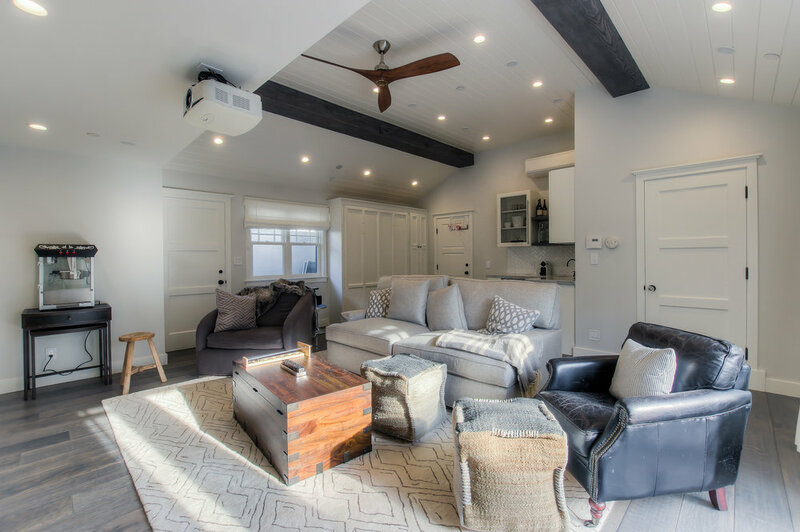 This garage conversion includes custom built in cabinets with barn doors and movie projection area, hardwood flooring and a built in wall folding bed cabinet 4" LED recessed lights throughout the vaulted ceilings with a white wood siding and reclaimed wood beams. This garage conversion includes custom built in cabinets with barn doors and movie projection area, hardwood flooring and a built in wall folding bed cabinet 4" LED recessed lights throughout the vaulted ceilings with a white wood siding and reclaimed wood beams A custom built in bar with Quartz counter tops and reclaimed wood shelves. The garage conversion includes custom built in cabinets with barn doors and movie projection area, hardwood flooring and a built in wall folding bed cabinet 4" LED recessed lights throughout the vaulted ceilings with a white wood siding and reclaimed wood beams A custom built in bar with Quartz counter tops and reclaimed wood shelves.